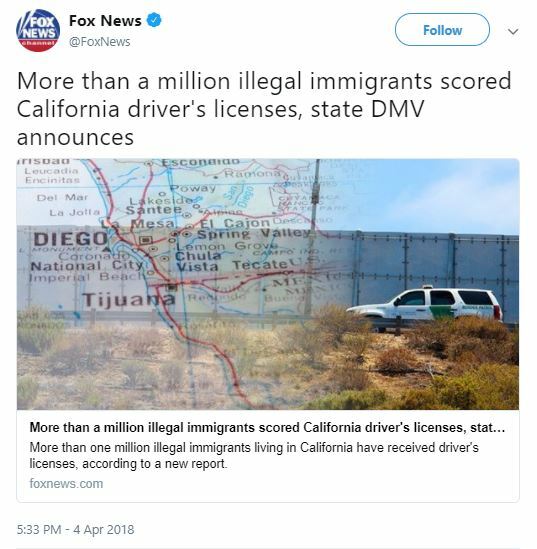 More than a million illegal immigrants have received California driver’s licenses, the state’s Division of Motor Vehicles (DMV) recently announced, according to Fox News. An estimated 2.3 million illegal immigrants live in the Golden State. In early 2015, Gov. Jerry Brown signed Assembly Bill 60, “The Safe and Responsible Drivers Act,” into law, which made it possible for illegal immigrants to obtain driver’s licenses. The purpose of the bill was to help illegal immigrants “get to work, drive their children to school, and run everyday errands without the fear of being pulled over,” according to DriveCA. They are invalid outside of the state of California and don’t grant illegal immigrants voting rights. “Immigrants are getting tested, licensed and insured, and this is making our roads safer for everyone,” former Assemblyman Luis Alejo said. Alejo, who is a Democrat, was the author of Assembly Bill 60 and now serves as a Monterey County supervisor. “Today, we see the law working the way it was intended to and [it] has dramatically improved the lives of a million immigrants and their families,” he continued. When the driver’s licenses were first offered in 2015, there was a large spike of applicants, which resulted in 605,000 illegal immigrants receiving them. Since that initial spike, significantly less applications have been submitted. California isn’t the only state that allows those who are in the U.S. illegally to receive driver’s licenses. Eleven other states, including Colorado, Hawaii, Vermont, New Mexico, Maryland, Illinois, Delaware, Washington, Nevada, Connecticut and Washington, D.C., have similar laws. Assembly Bill 60 isn’t the only piece of legislation that has been passed in California that benefits those without legal U.S. residency. Brown officially made California a sanctuary state at the beginning of 2018, which forbids local police departments from asking people about their immigration status and from cooperating with federal immigration enforcement officials. “These are uncertain times for undocumented Californians and their families, and this bill strikes a balance that will protect public safety, while bringing a measure of comfort to those families who are now living in fear everyday,” Brown said when signing the bill. Attorney General Jeff Sessions expressed his disapproval towards Brown’s sanctuary state bill. “The bill risks the safety of good law enforcement officers and the safety of the neighborhoods that need their protection the most,” Sessions had said.